Project Pegasus -  An epic journey of new discovery so fantastic that our natural instinct would be to block it out. finds ways to integrate cutting-edge tech developments into stuff the military might want. developed by DARPA in the 1970s code-named Project Pegasus. Upon graduating from UCLA in 1984, he became a journalist and protégé of editor Norman Cousins of theSaturday Review, who once compared him to Robert M. Hutchins and nominated him to be the editor of theBulletin of the Atomic Scientists. I am leading the campaign to achieve political recognition that Mars is inhabited because we must enact an international treaty to protect the ecology and civilization of Mars. We must remember that Mars does not belong to us. Mars belongs to the Martians. ​If we fail to recognize this, then we will fail our first major test of cosmic citizenship. I believe that the people of the Earth are ready for cosmic citizenship and I believe that they are ready for the truth! Project Talent, and the Mars ARK project. "Project Pegasus," and what he claimed to be the true history of U.S. time travel research and teleportation technology. As a child, he said his father volunteered him to be inducted into the experimental program, as a "trainee/guinea pig" from the years 1969 to 1972.
via a device derived from Tesla technology. adding that it's more like the TV show Sliders than the teleporters on Star Trek. 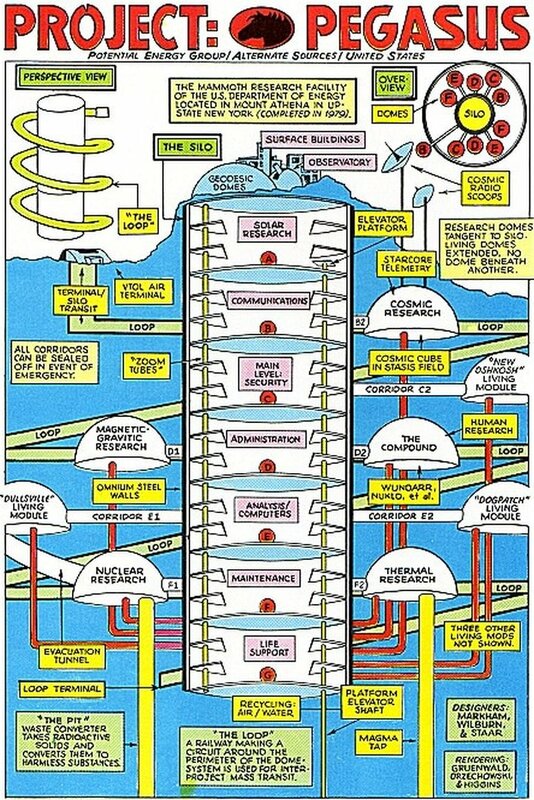 Time travel technology enabled the US to win the Cold War, as the government teleported military secrets into the future, to store for safekeeping, he detailed. The technology was also used to brief US Presidents like Clinton, the Bushes, and Obama about their destiny, years before they became President, Basiago claimed. He also asserted that Donald Rumsfeld and Gov. Bill Richardson both served in Project Pegasus, and he invited them to come forward with the truth. 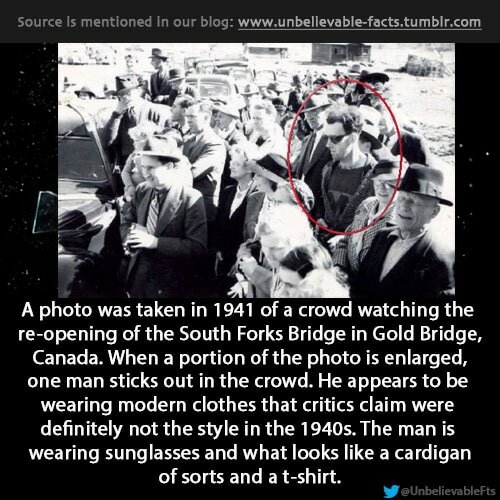 According to several reports and eye witness accounts the United States government achieved time travel and teleportation back in the late 1960’s. Events of what took place throughout the late 60’s through the 1980’s in a program called Project Pegasus seem quite astonishing. Most people reading the information I am posting here simply will not believe it to be truth. When you look back you would think that this technology was not even possible during that time period. But we are forgetting a very key aspect of what supposedly took place back then. According to many reliable sources humanity was in the midst of exchanging technologies with an advanced species of extraterrestrial races during this time. “Project Pegasus is a quest begun in 1968 by Andrew D. Basiago when he was serving as a child participant in the US time-space exploration program, Project Pegasus. Project Pegasus was the classified, defense-related research and development program under the Defense Advanced Research Projects Agency (DARPA) in which the US defense-technical community achieved time travel on behalf of the US government — the real Philadelphia Experiment. Project Pegasus was launched by the US government to perform “remote sensing in time” so that reliable information about past and future events could be provided to the US President, intelligence community, and military. The children found, however, that in the process of serving as child time travelers attached to Project Pegasus, they became America’s time-space pioneers. My Adventures in Project Pegasus at the Dawn of the Time-Space Age. In 1968, he resolved to one day tell the true story of his time travel experiences in Project Pegasus and reveal to the world that the US government had made secret a teleportation technology that if made public would revolutionize transportation across the face of our planet. Today, Andy serves as the Team Leader of the new Project Pegasus, the only group in the world that is lobbying the US government to declassify its time travel secrets. Under Andy’s leadership, the mission of today’s Project Pegasus is to lead the campaign in law, politics, and culture to urge the US government to disclose its teleportation capability, so that this revolutionary technology can be used to advantage humanity in the 21st century. Andy envisions a world in which teleports will replace airports for “real time” transit between major transport hubs around the world, thereby making long-distance travel faster, easier, safer, and cheaper. The declassification and deployment of the US government’s teleportation capability may also be the most important environmental cause of our time, for it will prevent billions of tons of pollutants from conventional transport from entering the atmosphere every year. 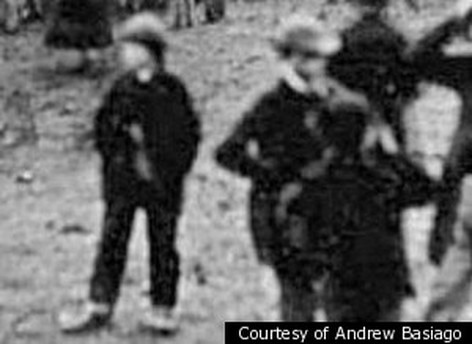 So from what I understand Andrew has been involved in time travel and as a child went back to civil war times and below here is a photo of Andrew in Gettysburg during the Lincoln speech. Here is a clip from the Huffington post about his travels. “Basiago said he experienced eight different time travel technologies during his stint in the program. Mostly, he said, his travel involved a teleporter based on technical papers supposedly found in pioneering mechanical engineer Nikola Tesla’s New York City apartment after his death in January 1943. “One felt either as if one was moving at a great rate of speed or moving not at all, as the universe was wrapped around one’s location,” Basiago said. Basiago claimed he can be seen in a photograph of Abraham Lincoln at Gettysburg in 1863, which he said he visited in 1972 via a plasma confinement chamber located in East Hanover, N.J.
“I had been dressed in period clothing, as a Union bugle boy,” he said. 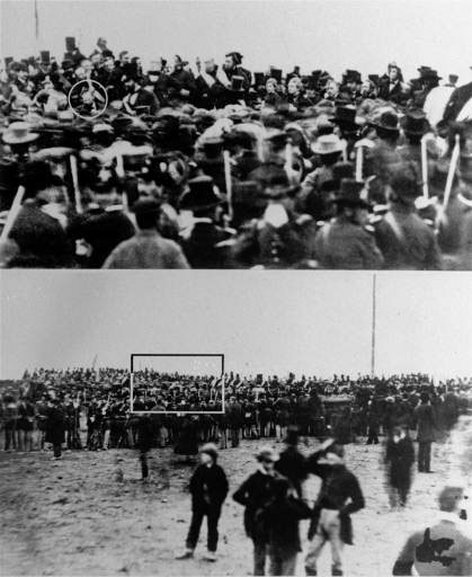 “I attracted so much attention at the Lincoln speech site at Gettysburg — wearing over-sized men’s street shoes — that I left the area around the dais and walked about 100 paces over to where I was photographed in the Josephine Cogg image of Lincoln at Gettysburg.” (The boy on the left in the photo below). And how did these alleged time travelers return to the present day or their point of origin? According to Basiago, some sort of holographic technology allowed them to travel both physically and virtually. Andrew and several others claimed to have experienced teleportation through what are called “jump rooms” and say that they have been to Mars. Here is a clip from angelic view. “According to Basiago, an elevator in that building would morph from a box into a cylinder and then passengers could step out onto the surface of Mars. He claimed to have interacted with Martians and been taken to their underground civilization where he was taught about the various Martian typologies. (Michael C. Relfe, Andrew D. Basiago, Arthur Neumann, William B. Stillings, and Bernard Mendez), a corroborating Mars colony recruit (Laura M. Eisenhower), four public servants who have been identified by others as Mars jumpers who have not come forward publicly but might (Barack H. Obama, Regina E. Dugan, Admiral Stansfield Turner, and Mary Jean Eisenhower), one deceased US astronaut who has been identified by three of his co-trainees as a fellow jumper (William C. McCool), one Naval attaché who has been identified by two jumpers as being present at the El Segundo, CA jump room site (Michael Strickland), one CIA agent who has been identified by two jumpers as a Mars training officer who they went on missions to Mars with (Courtney M. Hunt), and one Army scientific and technical intelligence officer who has been identified by three of his Mars trainees (Major Ed Dames). I cannot tell you either way if there is truth to Andrew’s claims but I will say he has a good vision for the future. “Imagine a world in which one could jump through Grand Central Teleport in New York City, travel through a tunnel in time-space, and emerge several seconds later at Union Teleport in Los Angeles. Both time travel and teleportation are possible according to most scientists of today. And if you believe an exchange of technologies took place with highly advanced E.T. races back in the mid twentieth century, then Project Pegasus was definitely in the realms of possibilities. And in fact regardless of whether or not any of these events took place, time travel and teleportation are in our future. Transportation will no longer involve the use of vehicles of any type. And with time travel you can just imagine what time and place throughout history you would want to visit. How about Roswell, New Mexico July 8th, 1947?